One of the observatories on the “Cygnus” aisle of the Astronomy Observation Field at Cherry Springs State Park. Full disclosure – for various reasons, we did our various astronomy-related activities at other places. But we included a visit to Cherry Springs itself in the itinerary. 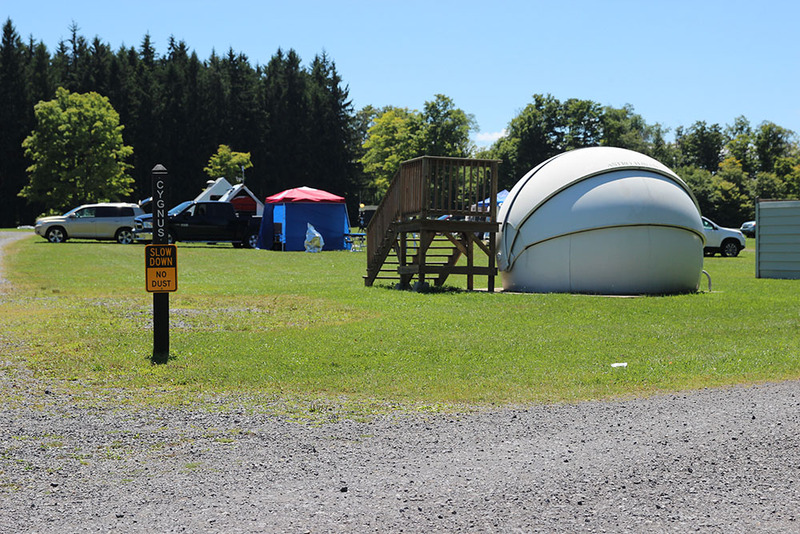 At the park, the main Astronomy Observation Field has a couple of aisles of telescope pads, as well as four observatory domes. And the different aisles on the field have names like Cygnus, Orion, and so forth. You could tell that there were some seriously gung-ho stargazers there; we saw some people with telephoto lenses that were more than a foot long. Cherry Springs does guided “tours” of the sky on certain days of the week, over in the field reserved for day users and non-campers. (For the main field, they’ve got very strict rules about cars entering after sundown – you’ve got to turn down your lights, for one thing. It’s also recommended that you put a red filter on your flashlight.) The tours fill up pretty quickly, so you have to book well in advance. The house where we were staying was near Coudersport, which is not too far from Cherry Springs. And there was a rather sizeable field near the house, so that became our own private planetarium. As night started to fall on our first evening, we trekked out to the field with cameras, mini-tripods and picnic blankets. We’d even invested in a new telescope, which we brought out to the field on subsequent sky-watching sessions. This was my first real foray into night sky photography. I’ve learned that a lot of it involves pointing your camera in the general direction of the constellation you wish to photograph, hitting the shutter on the 20-second delay, and praying that no one walks in front of your camera right at that moment. We lucked out: just as we were getting settled in the field, a meteor (a fairly large one, too) went zooming right through Scorpius’s claws. And then just to the left, there was the “teapot” part of Sagittarius coming up over the treeline. And way over our heads was the silvery mist of the Milky Way. 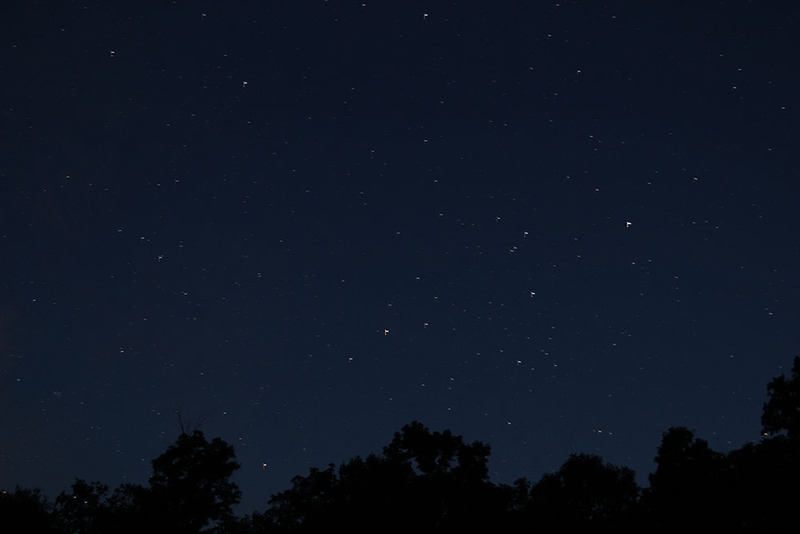 On the average night in northern New Jersey, even with clear skies, you won’t be able to see a third of the stars you’d see on a clear night over Coudersport and Cherry Springs. There’s something about seeing a sky full of stars and planets that, besides being really beautiful, really reminds you of your place in the universe.